As much as there is going on in the garden, I can’t help but write about two exciting spring events happening in the woods over on my parents’ farm. The first interesting event actually started a few months ago. 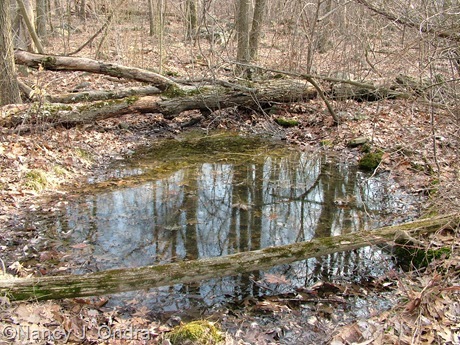 In early spring each year, as the snow melts and the ground thaws, water collects in a small depression up in the woods, creating a specialized little habitat known as a vernal pool or vernal pond. Unlike other sorts of wetlands, vernal pools hold water for only part of the year, typically drying up at some point during the summer. 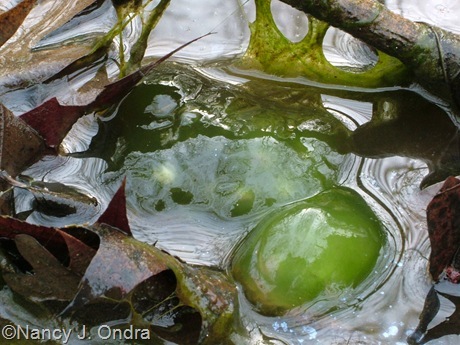 Fish can’t live there, and bullfrogs usually can’t either, so it’s an ideal place for creatures such as tree frogs and salamanders to lay their eggs with minimal danger from predators. 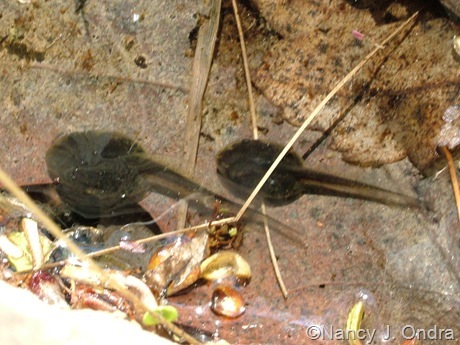 Mom and I usually start including the pool in our daily walk around the third week of March, once we start hearing the chirping of the spring peepers (Pseudacris crucifer), a species that also breeds in these habitats. Peepers are very small and very well camouflaged; I’ve looked for them often but never actually seen one, but boy are they loud! (You can hear clips of a single peeper and a peeper chorus under Vocalization on this page.) As quiet as we try to be, the peepers and other frogs know we’re coming, and all is silent by the time we reach the edge. I so wish I knew more about what we see in there. It’s obvious that some of the things are frog eggs, and I think some might be salamander eggs, but I don’t know how to tell them apart. 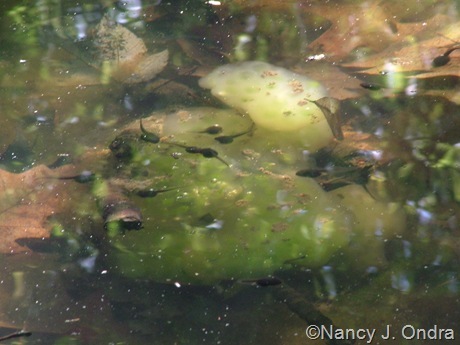 Within a few weeks, we see a whole lot of tadpoles: I’d guess that there are hundreds, if not over a thousand, in this tiny pool holding just a few inches of water. 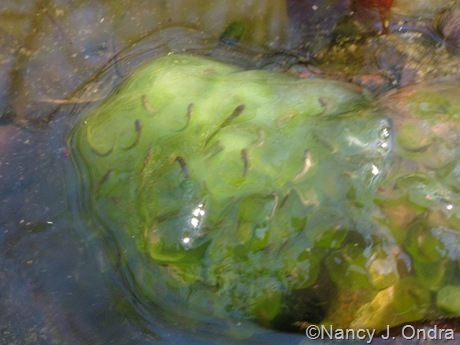 Right after they hatch, they seem to like to feed on the gelatinous material that’s around the egg masses. After that, they eat algae and leaf litter. One thing I haven’t caught yet is the point when they start changing into adults. Some years, the pool dries up before that happens; other years, I get too busy with gardening and forget to look. I’m going to try again this year, though. There are lots of other interesting creatures there too. In the process of trying to learn more about our vernal pool, I discovered that many states have web resources on these habitats. In Pennsylvania, we even have a registry for them, at The Pennsylvania Seasonal Pools Registry. The main Seasonal Pools page is linked to a number of pages where you can learn more about the ecology and conservation of these spaces. 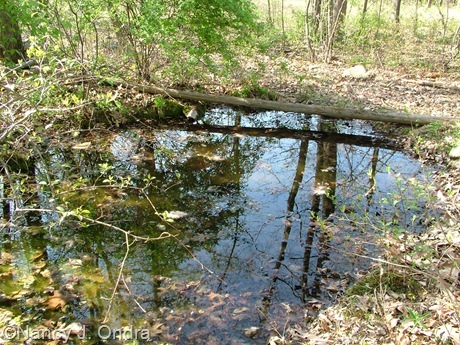 Vernal pools are especially susceptible to destruction because they’re not evident year ‘round. When they’re dry, they’re barely visible, and land developers can quickly destroy them with a single pass from a bulldozer. 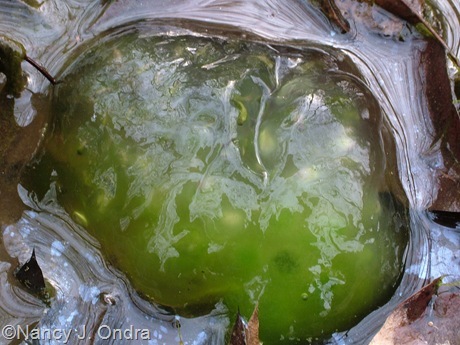 If you know of a vernal pool, or if you’d like to see if you could find one to visit, try Googling “vernal pool” and the name of your state to see if there’s a vernal pool registry program in your area. Now on to the second spring event: the return of the ramps. 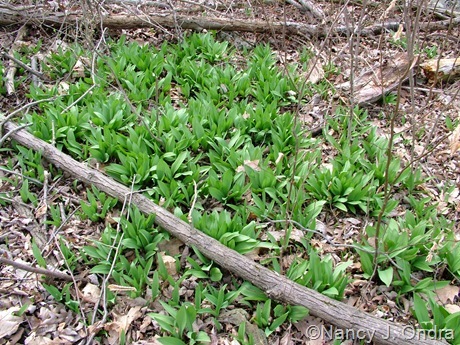 Ramps (Allium tricoccum), also know as wild leeks, are some of the first wildflowers to send up their leaves in spring. They’re pretty common in the woods in our area, and we have a couple of patches, so we figure it’s ok to nibble on a few. Mom remembers enjoying ramps during her childhood in central Pennsylvania, when her father would bring them back from his spring fishing trips, but she didn’t tell me about how good they were to eat until last year, when I pointed them out on one of our rambles. This spring, we tried a few when they were very young, and wow, were they delicious: oniony but with a definite garlic flavor, something like garlic chives but sweeter. Those early pickings were very tender, too. A few weeks later, the white (leaf base) parts were nice and crunchy, and the leaves were a little chewier but still great. We eat them fresh or chopped up into salads, but I understand they’re great for cooking too. There are even festivals where ramp aficionados celebrate their return, and I totally understand that passion. At some point in May, the fun will be over for the year, when the leaves die back. Clusters of white flowers can appear in June or July (you can see them and the seedheads here). I haven’t gotten any shots of my own yet, but I know our patch has flowered in the past because I spotted some empty seedheads, so I hope to catch them this summer. If you ever get the chance to try ramps for yourself, I heartily recommend them. It’s possible to grow them in the garden, too, if you have some shade and moist soil. Both seeds and plants are available from Prairie Moon Nursery. Try them once and you’ll know you have to have them! I enjoyed learning about ramps as I’m unfamiliar with them. Also enjoyed your photos of the eggs, tadpoles, and other ‘stuff’…I hope you are able to capture them in some detail as they begin to change! I can’t believe I didn’t know about ramps before, either. Makes me wonder what else Mom knows that she isn’t telling me. Your photographs are splendid, and you’ve made me alert to something important I had not paid attention to before. Thank you! I’m glad you visited and found something of interest, Marfy! These vernal pools are magical. 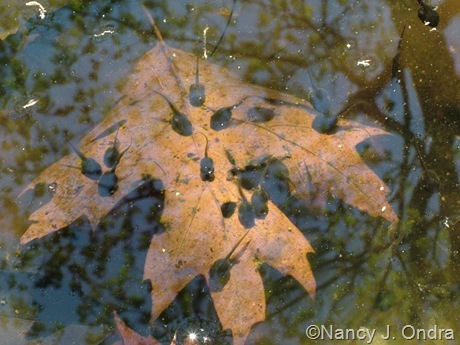 Nina at Nature Remains wrote extensively about the vernal pool near her home last year. Her beautiful prose and accompaning photos would be well worth searching through her archives to read. You would find many of your questions answered about the different egg sacks etc. 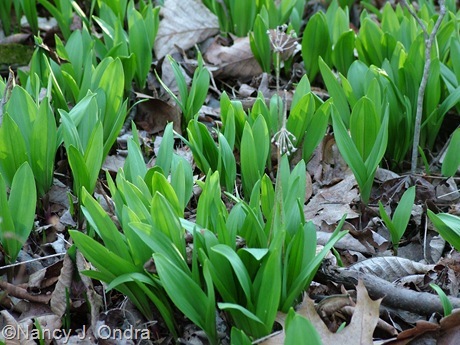 I have noticed these clumps of green ramps in the forest before. I didn’t know you could eat them. Hmmmm I will have to try a bite or two. Isn’t it fun to unlock some of the interesing tidbits that ones parents have in their vault of knowledge and lore?. Hey, thanks for the tip, Lisa. 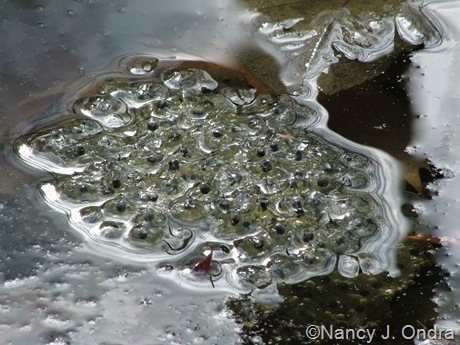 I found this more recent post at Nature Remains – First Frogs – which does make me think we have wood frog eggs, at least. 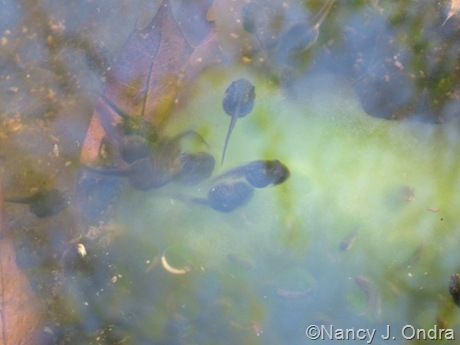 And oh wow – her 2009 Vernal Pool Journal. 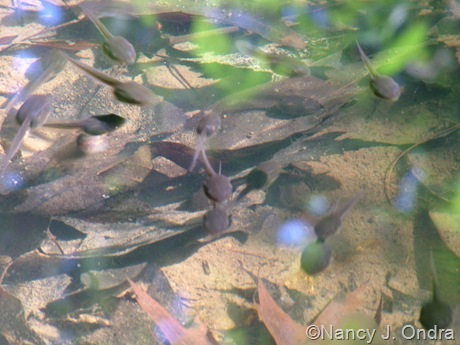 Every spring we hear the spring peepers in our neighbor’s pond. We have heard nothing so far this spring. Is it too early? Too cool? I can’t remember when they started in past years. We enjoy the song and always say, “Ah, the peepers are in love.” I hope they’re not gone. Those in our corner of Bucks County were practically deafening when we had that warm spell in early April, but they have been very quiet since the nights got chilly again. I hope that the cool weather accounts for the silence over your way. The peepers were singing last night! What a happy sound. “The peepers are in love” in Bethlehem. Good news! With this heat, I’m not surprised that they’re chirping away. Thank you for such an interesting posting. I never heard of vernal pools/ponds – would just think “standing water”, but guess it is much more than that. I wonder if the wild leeks grow around here, I have never noticed them, then again I have not looked for them as I don’t know them, but I have read a few blog posts about them this spring. Thanks for reading, Lene. I think the ramps/leeks have a wide range, but I’m not sure they are up in your area. 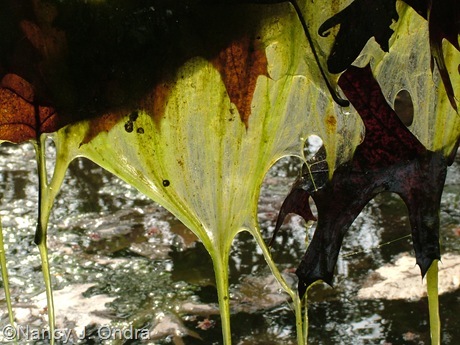 The vernal pool thing is very neat! It sure shows that you have a healthy environment around you if those amphibians love the area so much. Great for us – not so much for the mosquitoes! I’ve never tried a ramp but I’ve heard about them for years. I bet they would be great with some olive oil on the grill! I feel like a kid again after reading your post. 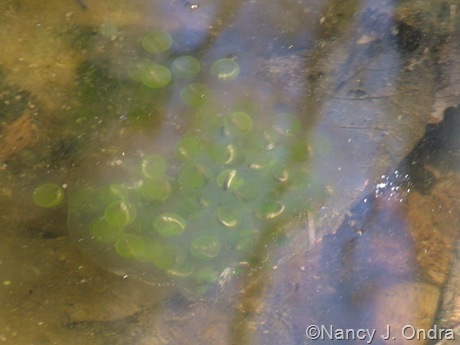 I almost forgot how spring in upstate NY meant scouring the nearby woods with my friends for frog eggs. Of course, that was after we’d fully stocked our ‘bakery’ with mud pies and mud cookies. Thanks for the little bit of nostalgia. Isn’t Mother Nature grand? What a lovely note, Debbie. I’m delighted to have brought back some good memories. 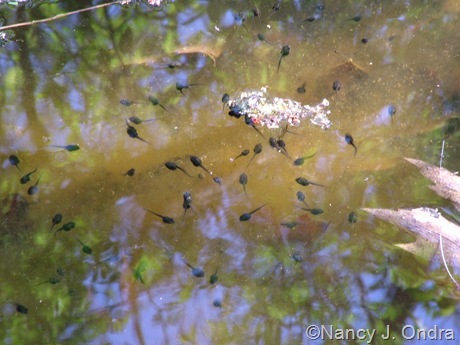 I haven’t found any vernal pools on our land, although we do have wetlands, and we do have the Frog Pond which is where the grandchildren catch newts, marvel at the sundews, and swim. 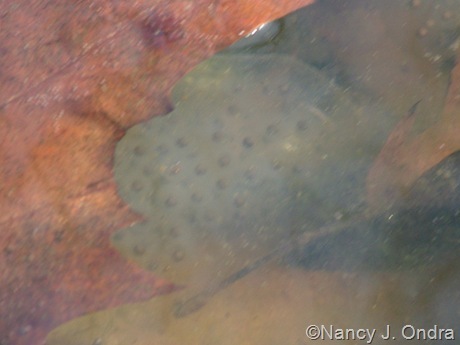 We see frog eggs, and hear the peepers and wood frogs, but this set of photographs is really extraordinary. You are so lucky to have your very own wetlands, Pat – and with sundews? Wow! Seasonal pools here happen now, if it would only rain. I have vlei lilies in pots. Leaves are thru, looking hopefully for flowers, where we see promising water. My Swiss husband knows Baerlauch (bear’s leeks) which looks much like your ramp. Today I harvested a few leaves of Tulbaghia with our dinner. We can eat the flowers too, and yours? I’ll bet the Tulbaghia leaves and flowers taste great! I’ve smelled them but never tried eating them. So far, I haven’t run across any references to eating the flowers of ramps. 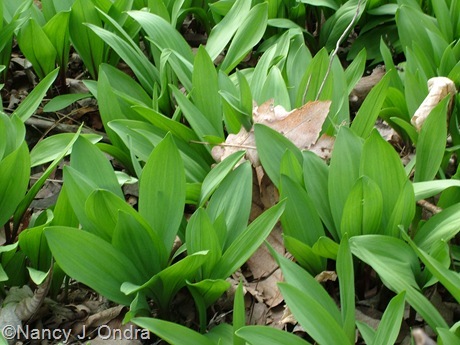 According to this page, our ramps are closely related to bear’s leeks (Allium ursinum). Wow, Nan, what amazing photos! Looks to me like you have a few toad egg masses there, too (though admittedly it’s been a while since I hit the herpetology books). We’re lucky to have a vernal pool in the woods across from our house, but alas, I’ve never ventured over to find it (trespassing issues) and have to make do with the peeper choruses. And you have ramps! I’ve never seen, much less eaten, one, though of course I’d heard of the festivals. Thanks for the link. Now I’ll have to buy one to add to my allium bed! Buy lots, if you can; that way, you’ll have some to eat next spring. They like moist woods, so they’d probably be perfect for one of your shady gardens. I liked the details in your photos of the pool. 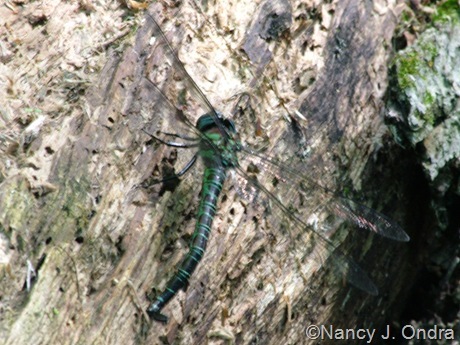 I’m always fascinated studying these areas, and the interesting life you can find in them. Our area has been very dry this spring, and most of the sloughs (small ponds on the prairie) are all dried up. I feel bad for the circling geese, looking for habitat. Hi Nan! Thanks to your article and photo of ramps which I just saw this morning, I was able to recognize them at Whole Foods this afternoon and will be cooking them for dinner, with pasta and pancetta. I would have missed them if I hadn’t seen your photo. That’s great, Lorraine! I hope you enjoyed them. I wonder where they came from. I noticed yesterday that our patch has already gone almost totally dormant, so no more for us until next April. Nan: The peepers sound is one of my all time favorites. I have vernal pools here but no ramps. Maybe I will order some so, thanks for that link. I’m sure they’d do well in your conditions, Layanee. Thanks for reminding me about them; it’s about time for them to start blooming.